First class dental habits are key to maintaining healthy teeth. Children should be encouraged to develop a good oral health routine from an early age. If you take care of your child’s teeth together, decay is entirely preventable. First teeth ( baby teeth) usually come through between six months and two and half years of age. These are followed by the first permanent ‘adult’ molars when the child is about six years, before the first teeth begin to fall out at around 6 or 7 years of age. These second teeth should all be through at around 12-14 years of age. (Teething is fully covered in our “Baby’s Teeth” leaflet). We can show your child the correct technique for tooth brushing here in the surgery. Children should have a regular check-ups as advised by your Dentist. We always strive to be child-friendly, and we encourage you to tell us if there is anything we can do that would make the visit better for you and your child. A good relationship with your dentist in childhood may prevent dental fears later - and may reduce the need for invasive treatment in the future. Coming to see the Dentist should be fun! Begin as soon as the first teeth appear (see separate leaflet on “Baby‘s Teeth“). Teeth should be brushed twice a day, using a small pea-sized quantity of fluoride toothpaste. Work around the mouth methodically, cleaning all surfaces. 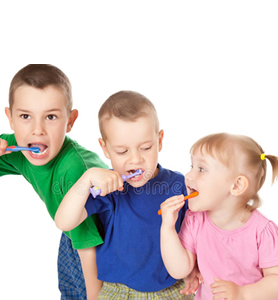 From around two years of age children will want to brush their own teeth and should be encouraged. However, they will still need adult help and supervision until at least the age of ten. Ensure that children spit out any excess toothpaste. After brushing, spit out, do not rinse. Flossing can begin when the child is ready to do so. Children’s brushes (for the appropriate age) should be used. There are a large number from which to choose and among their features will be stout or moulded handles, smaller heads and rounded filaments. Brushes should be changed every three months or sooner if the filaments are damaged. As soon as teeth are through they are at risk of decay. This occurs when bacteria feed on carbohydrates, especially sugars, in the mouth to make acid and this attacks the surface enamel. Sugars are present in many foods but it is the sugar in many manufactured foods that is the most harmful. Read labels carefully for hidden sugars and restrict food with added sugars to mealtimes only. It is the frequency of sugar intake that causes the problem. Ideally your child should drink only water and milk but, if used, dilute ’baby juices’ and squash with extra water and keep them to mealtimes. Choose sugar free medicines where it is possible. In most cases if your child chips or knocks their teeth, very little, if any treatment is needed but it is always best to seek advice or treatment as soon as you can. If a tooth is knocked out completely, please store it in milk and contact us as soon as possible. Captcha Please enter 61827 in below text box.